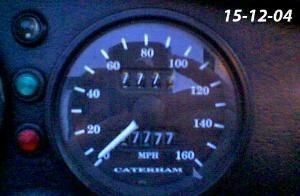 Welcome to our website, dedicated to our Caterham 7 ownership experience. 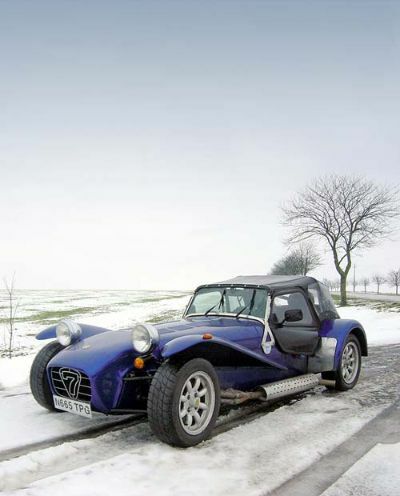 You will find information of our travels all around Europe, our track day experiences, details of the Caterham 7 models and cartoons that I create, technical info and help and some examples of my design work. You will also find many pictures - please be patient - they are all small files and hopefully are worth waiting for! Use the menu on the left to navigate, or the 'forward/back' icons at the bottom of each page. Video links are back up thanks to Gavin who is hosting...and see below for some Festive Pics!! Just a few seasonal extras! Some of these pictures appear elsewhere, but thought I would collect a few here for a few weeks! ..."The picture doesn't tell the whole story by a long way. We live in what was the epicentre of the '03 blizzard. 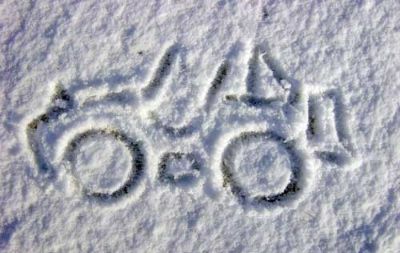 Whilst most local workers got stuck at hotels etc (sleeping on floors), I managed to make it all the way from Dartford to the bottom of my hill - including through country lanes, thick thick snow, some worrying moments and countless abandoned cars. I won't say it was fun. About 1/2 the 50 mile journey was fine, it was the other half that took four hours. But amongst friends and family, it seems I had the best time! CR500's and a light car seem to work (don't understand this)... The hill was too much for me and everyone else - but not our old Land Rover, so we dragged it the last few hundred metres home and left it where it is in the pic. The next morning, there were 'parked' cars everywhere. With the roads impassable, I stayed at home (instead of going to Aston Martin, as I was meant to), and took the picture when it was light enough. Yes it was damn cold. I used to keep a thermometer in the car. Minus 5degc was the coldest journey INSIDE that I had. Praise be to M&S skiing thermals!" 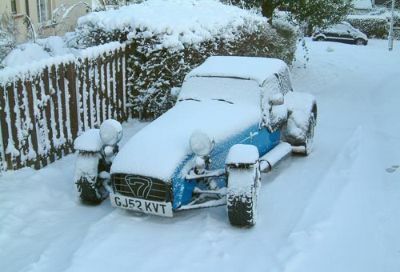 Good to see that Caterham staff also use the cars for every type of journey, in all weathers, all year round! Just outside the Circuit at Crois en Ternoise, Northern France. We had driven over - on a day trip - for a days circuit driving on one of their Test Days - unfortunately the track was closed - roof was up because despite this shot, we had just come through sleet and snow, on un-salted or gritted roads - good fun actually! 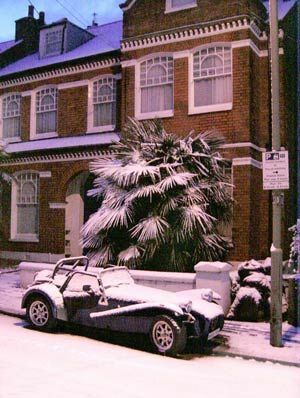 Sunny Balham, London, where our car lived outside for 18 months. All rights reserved, unauthorized duplication or use strictly prohibited - unless you ask! Oh yes - the tiny little arrow bottom right of each page will return you to the top of that page!